Studies in jazz music offer a progressive education in an environment of contemporary jazz and improvisation, where both training within the jazz tradition and developing innovative approaches are important. The studies offer many opportunities for individual development, which is at the centre of the learning process. It is important for students to be able to find a suitable path for themselves and to grasp a general perspective of jazz music both past and present. As communicating and playing with other performers is especially important in jazz music, ensembles play a large role in the daily learning process. Almost every year major international courses are held (“Crossing Borders” 2005–2010, “Nomazz Meets the Baltics” 2011–2012, “Girl Power in Jazz” 2014), and professor and student exchanges also occur on a yearly basis. Internationally known musicians Dave Liebman (saxophone, USA) and Django Bates (keyboard instruments, England) have given master classes at EAMT. The jazz music programme is also an active member of the IASJ (International Association of Schools of Jazz). 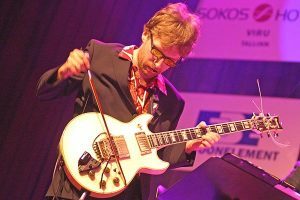 Active musicians teach jazz music studies, including guitar player Jaak Sooäär, percussionist Tanel Ruben, saxophonist and composer Raul Sööt, pianist Kristjan Randalu, bass player Taavo Remmel, vocalist Kadri Voorand and trumpeter and arranger Teet Raik. The distinctive style of the professors gives the students an opportunity to familiarize themselves with the different sides of jazz in the course of their studies. This might also be one reason why the students of the programme have won several international competitions in recent years.